Conventional staining technics for connective tissues, e.g., elastica stains, Van Gieson’s picro-fuchsin, and trichrome methods, were introduced between 1880 and 1910, but their chemical mechanism and significance remained obscure. Interpretations of staining patterns were based on tradition rather than chemical data. Histochemical studies during the 1960s demonstrated that elastica stains, e. g., resorcin-fuchsin, were not specific (Puchtler et al. 1961) and that there were striking differences between collagens (Puchtler and Sweat 1963, 1964a; Joiner et al. 1965; Smith et al. 1966); at that time all human collagen was still supposed to have the formula (a.1)2a.2. 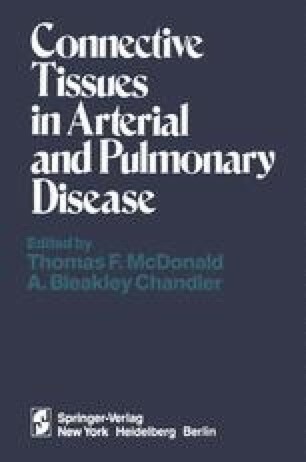 In addition, perusal of nineteenth century literature indicated that much early knowledge of connective tissue and arteriosclerosis has been forgotten. Many of these data have been rediscovered during the past twenty years.